This time I find him in Europe with a whole troupe of performers playing the part of American Indians at a Paris Expo! — in 1867 !!! The exhibition was inaugurated by Napoleon III on April 1 . It extended from both sides of the Seine, on the Champ de Mars and on the hill of Chaillot. Most countries were represented. 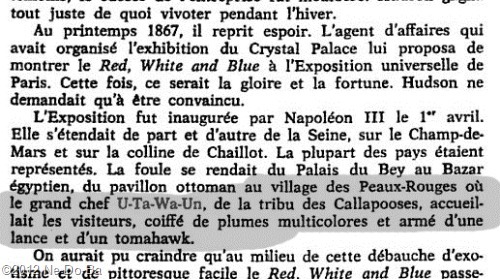 The crowd went to the palace of the Bey Egyptian Bazaar, Ottoman pavilion, the village where the red-skins Grand Chief U-Ta-Wa-Un, of the tribe of Callapooses, greeted visitors, wearing multicolored feathers and armed with a spear and tomahawk. Native Americans began traveling to Europe before Europeans were permanently settled in America. The earliest visits were not by choice, but as captives of early explorers. By the 18th Century, some were traveling to Europe by choice. In 1710, three Mohawk and a Mohegan (billed as “the Four Kings of Canada”) paid a political visit to Queen Anne. 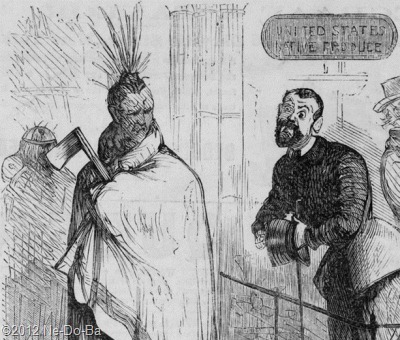 Europeans were fascinated with American Indians right from the beginning. Royalty often granted personal audiences to Natives traveling in Europe. During these European visits, Natives were wined and dined in the finest palaces, lavished with gifts, and treated as trained (but still dangerous) animals expected to perform for an audience on command. In 1839, George Catlin took his “Indian Gallery” of paintings on an eight year tour of European cities where they attracted large crowds. He used dance troupes of live Natives at the gallery to attract more public interest. Early cultural visits such as this created an expectation in European eyes as to what an American Indian should look and act like. Native People involved in these early forms of entertainment quickly learned they were “on display” and things went great as long as you played the part the way the audience expected. It had nothing to do with culture, tradition, or education. It was all about sensationalism and the entertainment value for the audience. This was true of audiences on both sides of the ocean. Indian imposters also made their way to Europe. As early as 1791 a non-Indian presented himself to London Society as a chief of the Cherokee and Creek Nations. It seems anyone could play the part of the “American Indian” for the public. Early entertainment troupes paved the way for the great success of later troupes, such as those who toured with the Wild West Shows beginning in the 1880s. OK, enough of the history lesson. Here we are, Paris, France in the year 1867. I think Europeans of this era are prepared to meet and accept the colorful character known as U-ta-wa-un. This is the earliest mention I have found for U-ta-wa-un. He styles himself “Grand Chief U-Ta-Wa-Un of the Callapooses”. The who? The Callapooses? Never heard of them. Wonder who came up with the name? Wonder what gullible white government official funded the exhibit? Was P. T. Barnum involved? But on a more serious note, so many questions come to mind. Is this where his career started? Who was in his troupe? What did the village look like? What did they think of Europe and the Expo? What were their living accommodations like? How many hours a day and days of the week were they on display? What did they do when they were not working? How many were actually Indian? And the really big question — are any of the Kanistanaux family with him? Marleah once mentioned she visited London and Paris. I may never learn the answer to any of these questions, but it won’t be for a lack of trying. No matter how hard I try to shake him, he won’t go away. Now he has me hooked and is reeling me in. I might as well give up fighting it. He has chosen me to be his biographer. And so, I think my adventure with him is just beginning.